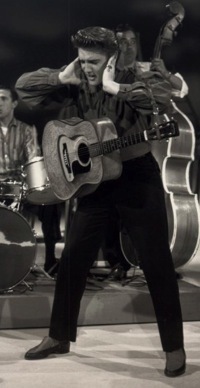 Over the past half century, no other episode in Elvis’s life has been examined so thoroughly as his appearances on the Sullivan show in late 1956 and early 1957. What could possibly be added to the subject that would be original and interesting? Nothing, perhaps, but there’s no harm, at least, in viewing again those classic performances with an eye for something out of the ordinary. As I watched, I tried to interpret what appeared on the screen as those who saw it live in the fifties might have. Also, I tried to pry my eyes off of Elvis from time to time and take in what was happening around him. The experience was fascinating and much more complex than the way it is often portrayed by Presley biographers. Elvis’s first appearance on September 9, 1956, was far and away the most significant of his three guest shots on the Sullivan show. Fans and critics alike tuned in to see what Presley would do on the small screen after being pigeonholed on The Steve Allen Show two months earlier. Indeed, the Jordanaires received extraordinary camera coverage in all of Presley’s appearances on the show. Elvis sang all or segments of 15 songs in the three shows, and the Jordanaires stood behind or next to him for every one of them. Presley introduced them to his nationwide audience as “the very wonderful Jordanaires.” His band, however, was far less visible. Scotty, Bill, and D.J. were seen on camera only three times, once in each show. The rest of the time they played their parts live on stage but off camera. The highlight of the September 9 opener was “Ready Teddy.” During parts of the number, the camera showed Presley’s full torso in motion. He performed a few twists and wiggles but certainly none of the “gyrations” that had drawn fervent criticism in the press after his June 6 appearance on The Milton Berle Show. The “Ready Teddy” number also spotlighted two other features of Presley’s act in the fifties. First, the presence of the band and the Jordanaires on stage showed how comfortable Elvis was as part of an ensemble. The interplay between Elvis and those seven other entertainers helped generate the energy and excitement that is associated with Presley in the fifties. Just how much credit Scotty, Bill, D.J., and the Jordanaires deserve for Elvis’s early success is debatable, but that they made a significant contribution to his act is undeniable. Another Presley trait evident in the “Ready Teddy” Sullivan performance is how much fun Elvis had on stage. The facial contortions, the momentary standstill, and the ever-present smile revealed a performer who found great joy on the stage. Elvis never took himself seriously in front of an audience, unlike many other rockers who acted like they were suffering physical pain during their acts. 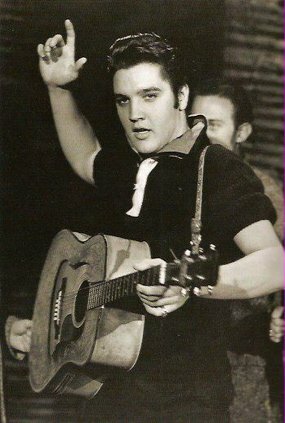 Even half a century later, “from the waist up” is a pop culture idiom associated with Elvis Presley’s appearance on the Sullivan show in the fifties. On the surface, it suggests that Ed Sullivan refused to allow cameras to film Presley below the belt. As noted with “Ready Teddy,” that was not completely true. In addition to that number, Elvis could be viewed from head to foot when he performed “Love Me” and “Hound Dog” on the October 28 show and while singing “Peace in the Valley” on January 6, 1957. On the other hand, it has been reported often through the years that Presley was filmed from the waist up only once on the Sullivan shows, that being when he performed “Hound Dog” on the initial show in September. That assertion is also inaccurate. On the September show, cameras never ventured below Elvis’s belt on “Don’t Be Cruel” and “Love Me Tender.” And in the January show, it was all belly button and above during Presley renditions of “Hound Dog,” “Heartbreak Hotel,” “Don’t Be Cruel,” and “Too Much.” Overall, then, the “from the waist up” Elvis controversy on the Sullivan shows was much ado about nothing. An embarrassing moment for Elvis, which occurred in the October 28 show, rarely seems to arise in discussions of the Sullivan appearances. Half way through “Love Me,” Elvis froze momentarily on the lyrics. The line was to have been, “I would beg and steal.” Instead, Presley stumbled, “I—, I—, I—, Somebody— beg and steal.” It’s unclear whether one of the Jordanaires provided a prompt to get Elvis back on track or whether he recovered on his own, but it must have been a frightening moment for Presley, knowing that a huge national TV audience was watching him draw a blank. Finally, Ed Sullivan himself played a significant role on camera during Presley’s three appearances. Of course, he was recovering from injuries suffered in an automobile accident and was not in the studio for Presley’s initial appearance on September 9. Still, Elvis twice paid homage to his absent host. 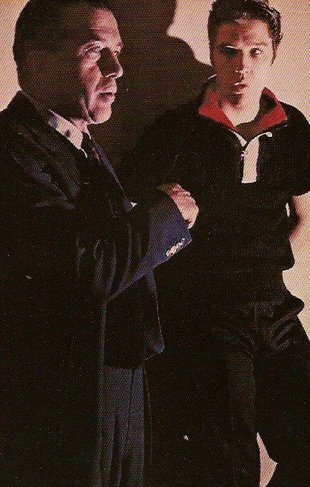 Before launching into his first number, Elvis declared that his appearance on Sullivan’s show was “probably the greatest honor I have had ever had in his life.” At the end of show, Presley wished Sullivan a quick recovery and said he looked forward to seeing him on the October 28 show. On that second Presley show, Sullivan reminded the girls in the studio audience of the promise he had extracted from them to keep quiet while Elvis was singing. "Even half a century later, 'from the waist up' is a pop culture idiom associated with Elvis Presley’s appearance on the Sullivan show in the fifties."